On Tuesday, the West Bank ruling Fatah prime minister Rami al-Hamdallah chaired Fatah and Hamas cabinet meeting in Gaza Strip for the first time since 2014 in a move toward establishing a Palestinian Authority unity government between the Islamist and pro-US secularist factions. Hamdallah told ministers that the meeting was a major step in a reconciliation process promoted by neighboring Egypt and other US-allied Arab countries. “Today, we stand before an important historical moment as we begin to get over our wounds, put our differences aside and place the higher national interest above all else,” Hamdallah said. It’s wishful thinking, I must say. It’s Western move to demilitarize Islamic resistance groups allied to Iran, Qatar and Hizbullah and make its poodle Mahmoud Abbas as ruler of both West Bank and Gaza. Abbas refuses to abandon chairmanship of Palestinian Authority which expired in January 2009. The Islamist resistance groups Hamas and its ally Islamic Jihad took over control of Gaza from Palestinian Authority in 2007 after Fatah leader Mahmoud Abbas carried an armed coup against Hamas with the help of the US and Israel. Fatah receives cash from the US, EU and Israel to run its ghetto entity. Hamas receives cash from Imam Khomeini Foundation and Qatar. Zionist entity’s prime minister Benjamin Netanyahu call the Fatah-Hamas cabinet meeting bogus reconciliations. He also warned the Palestinian Authority administration that Israel will never negotiate with it until it recognize Israel as a Jewish state, disband the Hamas military arm and sever its alliance with Iran (watch video below). Hamas has never pulled out of the Palestinian Authority but its armed wing and Islamic Jihad doesn’t recognize Mahmoud Abbas authority. 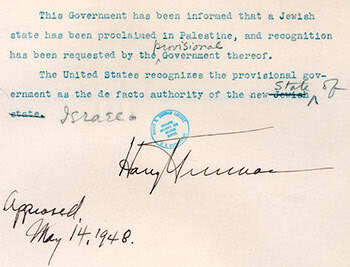 Interestingly, Israel’s surrogate mother United States has not recognized the entity as Jewish state since its birth on May 14, 1948 (see the document signed by US president Harry Truman above). This entry was posted in Islamic Resistance and tagged Israeli terrorism. Bookmark the permalink.